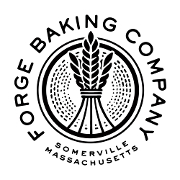 It is the mission of Forge Baking Company to: Provide our community with baked goods, coffee and fare of exceptional quality, made with ingredients sourced mindfully by passionate and skilled artisans. Provide a place of work that is safe and supportive while fostering individual growth and encouraging our staff to participate in the direction of the company at every stage of their career. Consider our impact on the environment every day and to mitigate that impact through the continual implementation of sustainable business practices.